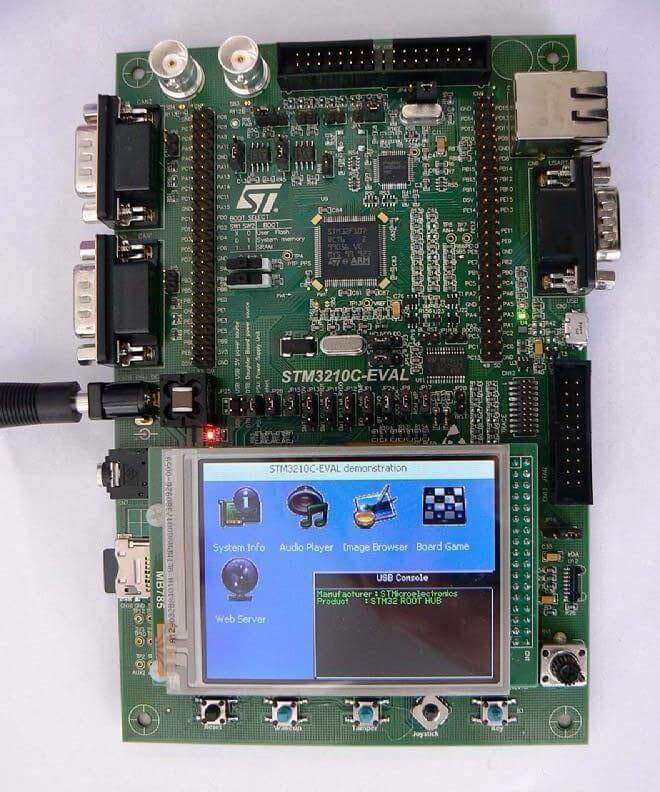 The STM3210C-EVAL evaluation board is a complete development platform for STMicroelectronic’s ARM Cortex-M3 core-based STM32F107VCT microcontroller. The range of hardware features on the board help you to evaluate all peripherals (USB-OTG FS, ethernet, motor control, CAN, microSD CardTM, smartcard, USART, audio DAC, MEMS, EEPROM and more) and develop your own applications. More information about the board can be found at the STM3210C-EVAL website . Boot from user Flash, system memory or SRAM. I2S audio DAC, stereo audio jack. 2 GByte (or more) microSD CardTM. Both type A and B smartcard support. I2C compatible serial interface 64 Kbit EEPROM, MEMS and I/O expander. USB-OTG full speed, USB microAB connector. Two channels of CAN2.0A/B compliant connection. JTAG and trace debug support. 3.2” 240x320 TFT color LCD with touch screen. Reset, Wakeup, Tamper and User button. Extension connector for daughterboard or wrapping board. The default configuration can be found in the defconfig file boards/arm/stm3210c_eval/stm3210c_eval_defconfig. 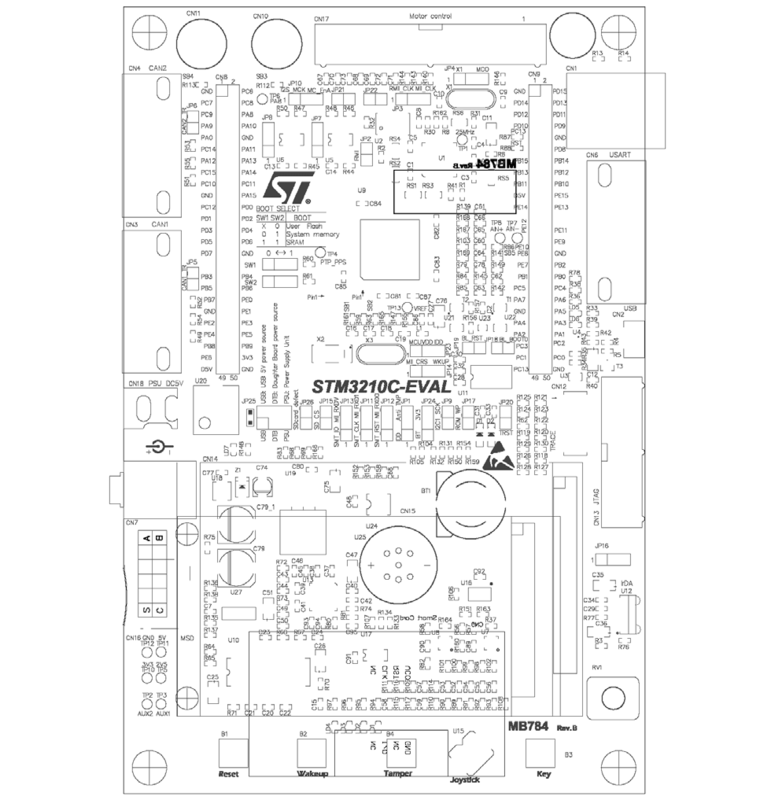 STM3210C-EVAL board includes an ST-LINK/V2-1 embedded debug tool interface. At power-on, the board is in firmware-upgrade mode (also called DFU for “Device Firmware Upgrade”), allowing the firmware to be updated through the USB. This interface is supported by the openocd version included in Zephyr SDK. Applications for the stm3210c_eval board configuration can be built and flashed in the usual way (see Build an Application and Run an Application for more details). Connect the STM3210C-EVAL to your host computer using the USB port, then build and flash an application in the usual way.